Juanita’s background is as a community pharmacist. She became accredited to perform medication reviews in aged care homes in 1997. From 2001, Juanita worked as a pharmacist in England where she provided pharmaceutical advice to GPs, developed programs promoting optimum medication use and completed a Master of Science degree at Keele University investigating medication adherence in older people. 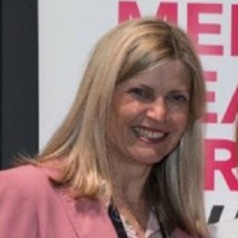 Juanita returned to Australia in 2006 and completed her doctorate in 2011 with her thesis entitled: “Roles for pharmacists in improving the quality use of psychotropic medicines in aged care homes (ACHs)”. As part of the PhD an intervention project, ‘RedUSe’ (Redusing Use of Sedatives), was developed and trialled; for which Juanita was awarded an International Psychogeriatric Association Junior Research award in 2009. Juanita commenced a NHMRC Translating Research Into Practice (TRIP) fellowship in 2014. The RedUse project was expanded to 150 ACHs in 6 Australian states and the ACT from 2014-2016, significantly reducing the use of antipsychotics and benzodiazepines by 13% and 21%, respectively. Two thirds of participant homes reduced usage rates of both psychotropics and over 2500 ACH staff attended training sessions. The RedUSe project was awarded the 2018 Mental Health Services (TheMHS) award for Education, Training or Workforce development. RedUSe: reducing antipsychotic and benzodiazepine prescribing in residential aged care facilities., Medical Journal of Australia May 21;208(9):398-403. An Internet-Based Method for Extracting Nursing Home Resident Sedative Medication Data From Pharmacy Packing Systems: Descriptive Evaluation, Journal of Medical Internet Research. Aug 3;19(8):e283.